Rainbow Swash is a work by the artist, Corita Kent who also designed the 1985 US Love Stamp for the US Postal Service. The rainbow design painted on a 140-foot tall LNG storage tank is the largest copyrighted work of art in the world. Highly visible from daily commuters drives on the Southeast Expressway (Interstate 93), the landmark is considered one of the major landmarks of Boston, akin to the Citgo sign. 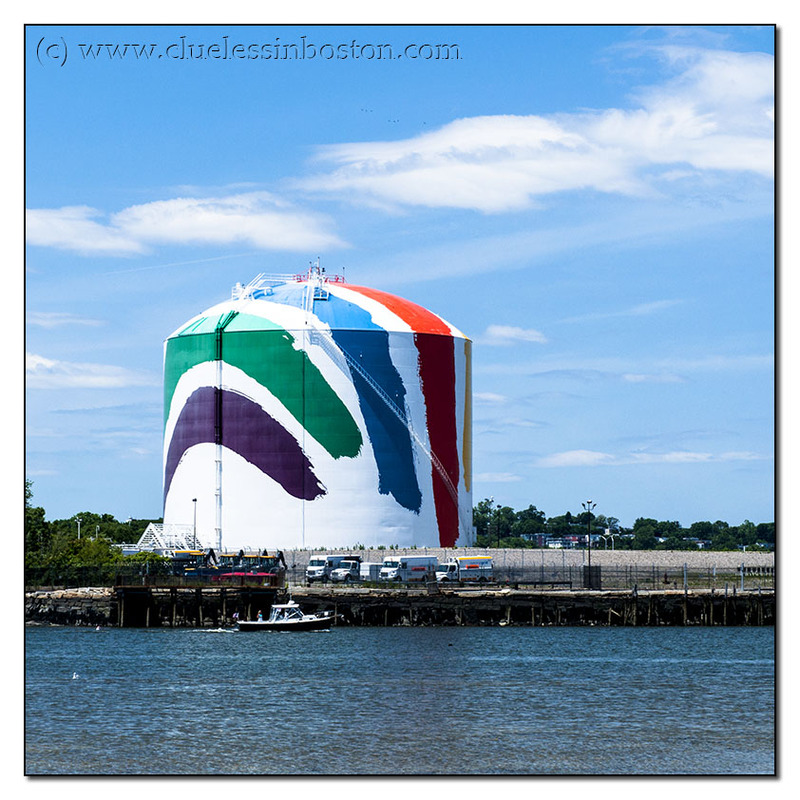 In 1971, then-Boston Gas Company president Eli Goldstone commissioned Corita Kent to paint the Rainbow Swash design on one of two adjacent LNG tanks facing Boston's Southeast Expressway. The original design was painted on an 8-inch (20 cm) scale model with 20 painters reproducing the work on the 140-foot high tank. Since the 1970s, the Rainbow Swash has been controversial. The mural was criticized as featuring a profile of Vietnamese Leader Ho Chi Minh's face in its blue stripe (not shown here). Kent was a peace activist and some believe she was protesting the Vietnam War, but Kent herself always denied embedding such a profile. In 1992, the original rainbow-painted LNG tank was torn down and the Rainbow Swash was recreated on the adjacent tank despite objections from veterans groups. However, the blue stripe is less pronounced in the 1992 reproduction. I always loved the original tank. Doing this was a bold thing for a traditional gas company to do. I have been away from Boston for a long time and didn't realize that this is a second tank. I remember being a little girl in the back seat of the car looking for the rainbow as we drove down the highway - a landmark that helped me know how close we were to home or to Boston! A very nice idea to bring beautiful colors for this storage tank, I like it a lot! As long as we're obliged to endure gas tanks, why not to make pieces of art from them?It brings colors to the landscape! I never knew this public artwork had a name. "Rainbow Swash" is well chosen.. Very colourful and I like Jack think it was a bold move by the company. Colourful for sure and different ! with an artwork like this, for sure it would stand out !